Passenger numbers at Manchester Airport have reached record levels, with 23 million people passing through its doors in the past year. The figure, which is the highest in its 77-year history, represents a 5% increase on the previous 12 months and a jump of around 30% compared with 2010. The milestone follows 19 consecutive months of increasing passenger numbers at the airport, which offers flights to 210 destinations around the world including Dubai, Dublin and Tenerife. The airport is expecting a big influx of passengers this December as the Christmas holiday season gets under way, while managers are predicting next year will be even busier due to the launch of new routes to China, Boston and Los Angeles. Passengers flying from Manchester, or any other airport for that matter, may be eager to get away this Christmas, and in all the haste it can be easy to forget about travel insurance. But anyone travelling without it could end up having to pay sky-high medical bills or expenses incurred by flight delays. 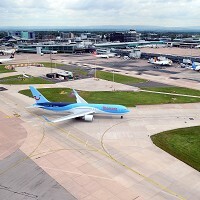 Manchester Airport's managing director Ken O'Toole says more than 22 million people live within two hours of the airport, and the addition of new routes and increased frequencies is seeing both business and leisure customers choosing to fly from there. Its continued growth is "testament to the role we play in connecting people across the North to destinations in all four corners of the world", he adds. Airport officials calculated that Lucy Chaplin, 22, from Wakefield, was the 23 millionth passenger since November last year. She was booked on an easyJet flight to Geneva on Monday morning.